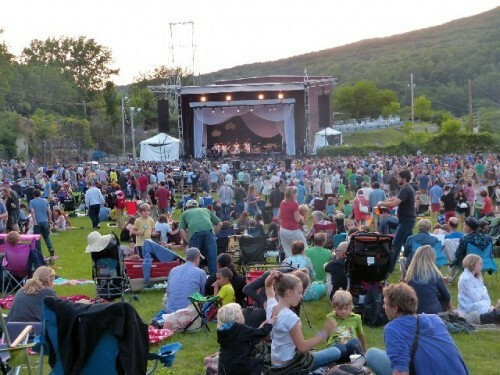 The action returns to Mass MoCA's Joe Thompson field. WILCO and REAL ESTATE invade North Adams and the Massachusetts Museum of Contemporary Art (Mass MoCA) on Friday night to begin three days of non-stop music. Jeff Tweedy and WILCO are most likely to play an all acoustic set followed by an electric encore on opening night. Their history of not following the rules for the 19 years the band has been together accounts for interesting music evenings. The last time WILCO took stage at Mass MoCA, they played an all request, covers show. No telling what Saturday nights venue will be? If you haven't visited Mass MoCA before, you will be amazed to see the large grounds, which include 26 buildings from the 19th century, an open space area the size of a football field, all housed in a spacious 13 acres. The festival began in 2010 and was a yearly event. It now takes place every other year, which makes it a treat for all involved. You can bring in water and food, but, no coolers. Visit www.solidsoundfestival.com and view the weekend lineup and cruise the ever so popular Frequently Asked Questions (FAQ) section. REAL ESTATE opens the main stage at 7:45pm, followed by WILCO at 9:15pm.